Despite political turmoil at home, many American Depository Receipts (ADRs) of Brazilian companies are doing well, thanks to strong liquidity in the United States. But volatility is also hurting many stocks. Jose Marcos Treiger, head of investor relations at Brazil’s petrochemical giant Braskem, is a big fan of ADRs. He has seen firsthand the positive results the ADR-issues have brought—first to pulp producer Aracruz in 1992, where Treiger worked as an investor relations officer, then again at Braskem last year. On September 22 of last year Braskem raised $281.5 million after issuing 9 million depository receipts in New York. “This became the most important and biggest equity offering by Brazil in 2004,” says Treiger, who is also a former president of the Brazilian Institute of Investor Relations (IBRI). The ADR issue actually had more demand, with total interest worth $1.9 billion, thanks to an ambitious road-show that included 110 meetings in the United States, Europe, Argentina and Brazil. Treiger believes part of the reason for the issue’s success was that the company rented a private jet to bring the executives to meet with investors. “We were everywhere whenever possible,” he says. Braskem’s ADR (BAK) was among the five best-performing ADRs on the NYSE last year and the overall best performer in 2003. The Braskem ADR was officially listed in September 2003 after it replaced the ADR being held by Copene. Braskem is the result of the merger of various petrochemical companies, including Copene. Thanks to the capital raised last year, Braskem was able to reduce its debt, while raising its international profile. “You can see how important the ADRs are to [that] success,” Treiger says. Alexandre Q. Fernandes is another keen supporter of ADRs. As disclosure manager of investor relations at Petrobras, Brazil’s largest company and the second-most traded Brazilian ADR, he’s seen the company’s depositary receipts (DRs), whose symbols are PBR (common) and PBRA (preferred), skyrocket from $25.25 and $12.74, respectively, to $52.80 and $46.51 on June 28. “PBR is among the 10 most-NYSE-negotiated ADRs, and PBRA among the 20 most negotiated,” he points out. While volatility has affected some shares, overall Brazilian ADRs have gained in value and volume the past year. The Bank of New York’s Brazil ADR Index went from $84.88 to $155.49 in the 52-week period ended on June 30. In the first six months of this year it gained 13%. The increase is due to a combination of factors, including significant revenue and earnings growth by the companies, increased confidence in Brazil’s macroeconomic policies and economic outlook and growing liquidity among US investors. 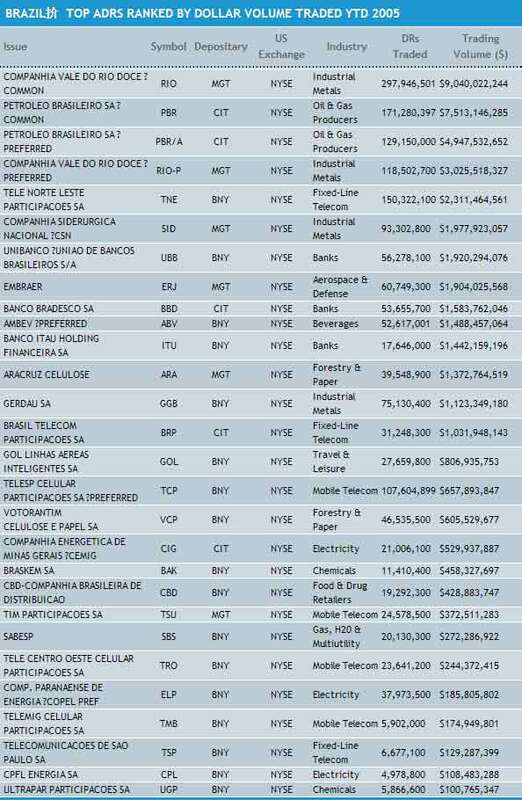 The index includes 34 Brazilian companies, all of which are listed on the NYSE. All but five posted gains in the 52-week period ended June 30. The strongest gain was registered by Perdigao (PGA), which saw a 135% increase in its ADR price. Banco Bradesco (BBD) followed at 126%. Other big winners include Cemig (CIG), Ultrapar (UGP), Banco Itaú Holding (ITU), and the two companies with the most traded ADRs—Companhia Vale do Rio Doce (RIO and RIO-P) and Petrobras. The worst decline was posted by wireless operator Telesp Celular Participações, which saw its preferred ADR (TCP) decline by 44%, followed by long-distance telephone operator Embratel (EMT), with a 23% decline, according to data from the Bank of New York. Despite Telesp Celular’s recent tumble, Charles Allen, the company’s investor relations director, remains a firm believer in the benefits of ADRs. “It’s liquidity and exposure to the international market,” he says. “I don’t see any disadvantage in having ADRs except for a slight amount of additional paperwork, but that’s it.” Under the Vivo brand, Telesp Celular Participações operates Brazil’s top wireless operator. The Telesp ADR was launched in November 1998 as part of the Telebras ADR, which was later split as a result of the privatization of Telebras. But not everyone sees the ADRs as a panacea. For Luiz Gonzaga Murat, chief financial officer of Brazilian food producer Sadia, having an ADR is a double-edged sword. “Our program was launched … in order to access the American equity market and open the possibility of Sadia participating in the most developed worldwide market,” he says. While that is clearly an advantage, information disclosed in relation to the ADR can reach the company’s competitors. Sadia also has to bear extra costs simply to have an ADR, although it has not participated in any equity calls in the past 10 years, Murat says. Nevertheless, the Sadia executive is pleased with the result. Sadia’s Level II ADR (SDA) has traded a daily average of $679,672 in the first quarter of this year. That’s more than twice the average for all of 2004. However, its value declined from $66.05 at the start of this year to $19.54 in early trading on July 1. The ADRs provide access to significantly larger markets than local stock exchanges such as the São Paulo Stock Exchange (Bovespa), Brazilian executives and independent analysts point out. “The stock exchanges in Brazil have small volumes compared to the big financial centers,” says Pedro Roberto Galdi, a São Paulo-based analyst with ABN AMRO. That was a major driver behind the decision by Companhia Vale do Rio Doce (CVRD) to launch an ADR. The company wanted “to reach a large pool of investors and increase the company’s shareholder base,” says Fatima Cristina, CVRD’s international spokesperson. Investors are also sometimes wary of putting their money into the local exchanges because they are concerned about regulation or other issues like currency differences, while some funds are not permitted to trade in stocks not listed on US exchanges. Bovespa, for example, is weakened by questions around minority rights, although there are reform proposals to make the exchange more efficient, says Christopher Garman, a São Paulo-based analyst with the Eurasia Group. “Unfortunately, [local] capital markets are not sufficiently developed,” he says. Soares from Banco Itaú agrees. “Entering in the ADRs market, Banco Itaú had to fulfill the rules of US law that is different from Brazilian, and then we made it an opportunity to improve our controls in advance of any Brazilian legal imposition,” he says. Last year the bank created an audit committee, formed by three councilors (two independents and one external). The company’s corporate governance standards are now in line with Sarbanes-Oxley requirements. “The disclosure and the expansion of controls shouldn’t be treated as an obligation but always like an opportunity to improve all the inside process,” Soares says. Rene Boettcher, vice president at the Bank of New York and head of Latin America marketing for ADRs, points out that Brazilian companies—as well as public regulations—have made significant progress the past few years. 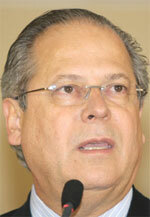 “Overall, in the corporate governance landscape, Brazil has made huge strides to become more transparent. 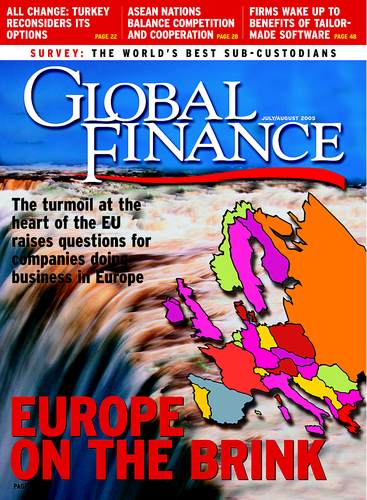 Corporate governance has been a huge topic the last two years,” he says. Brazil is the top ADR market in Latin America, with 96 ADR programs, compared with 82 for Mexico. Worldwide, it ranked third last year measured by trading value and fourth in trading volume, according to the Bank of New York. Eight new Brazilian ADR transactions raised $1.1 billion last year—almost three times as much as the capital raised in 2003. Among the most successful was the ADR launch of airline Gol Linhas Aéreas Inteligentes (GOL). Brazilian companies are using ADRs to receive exposure and visibility in the US market, broaden shareholder base, get more sell-side coverage, increase interest in the country through the big companies, and use ADRs as M&A; currency, says Candice Teruszkin, regional head of Latin America for ADRs at JPMorgan. Because of their flexibility and liquidity, they form a useful addition to a company’s financial toolbox. Apart from ADRs, Brazilian companies typically use the Bovespa or even European stock exchanges to raise funds. Telesp, for example, lists two shares on Bovespa (ordinary and preferred) and has a program of bonds (through national and international markets) and some loans from local development banks, Allen says. “We’re glad to have many sources, including the NYSE, Bovespa or other markets,” he says. Brazilian companies Braskem, Sadia and pulp-and-paper-producer Suzano Bahia Sul Papel e Celulose are also listed on Latibex, a market in Madrid on which individual Latin American companies may list their shares. Braskem was first out, with a listing on October 8, 2003, while Sadia was the latest addition from Brazil, with a listing on November 15 of last year. The demand for existing Brazilian ADRs is high and has helped offset the relatively low number of new issues the past few years. Last year there were only six new issues, and the year before that, only one. That compares with an average of 10 during each of the previous four years. So far this year, two companies have issues two ADRs each—transportation company ALL- América Latina Logistica and online retailer Submarino in March and April. Of today’s 10 most popular ADRs, six were launched in 2000 or later. In terms of sectors, electric utility accounts for most of the ADRs (with 21), followed by telecommunications (13) and metal production and distribution (8). In early June Brazilian legislator Roberto Jefferson from the Labor Party claimed that President Luiz Inácio Lula da Silva’s Workers’ Party (PT) paid lawmakers money to support the coalition government. Lula has denied wrongdoing, but four of his top aides resigned by mid July: chief of staff José Dirceu, PT secretary general Silvio Pereira, party head José Genoino and PT treasurer Delúbio Soares. Lula has vowed to investigate fully all the charges and punish whoever is guilty. Even though no conclusion has yet been reached, the scandal has dampened enthusiasm for Brazilian ADRs. Leading ADR’s such as CVRD (RIO), Gerdau (GGB), CSN (SID) and Gol (GOL) all fell during July 5 trading, mostly as a result of the growing political scandal. “The repercussions for Brazilian ADRs are somewhat mitigated by the investigation not being able to impact directly President Lula, and it’s difficult to see a scenario for an impeachment,” says Christopher Garman, a São Paulo-based analyst with the Eurasia Group. Brazilian ADRs had, in fact, rallied on the news of Dirceu’s resignation and the fact that Jefferson had been unable to present concrete evidence for his accusations.